Professor Eric Rauchway is an expert on U.S. history from the Civil War through the Second World War. In addition to being an admired professor at UC Davis, Rauchway is a critically acclaimed author. Rauchway has published six books that detail particular time periods of U.S. history, exploring the interactions between economic and federal policy. Additionally, Rauchway has written historical pieces for several publications, including The New York Times, Financial Times, and the Times Literary Supplement. Outside of history, he has written a novel that serves as a noncanonical sequel to F. Scott Fitzgerald’s "The Great Gatsby." College of Letters and Sciences student intern James Sommer ’18 sat down with Rauchway to discuss his latest book, "The Money Makers: How Roosevelt and Keynes Ended the Depression, Defeated Fascism, and Secured a Prosperous Peace," and his new book, "Winter War: Hoover, Roosevelt, and the First Clash Over the New Deal," due for publication in late 2018. 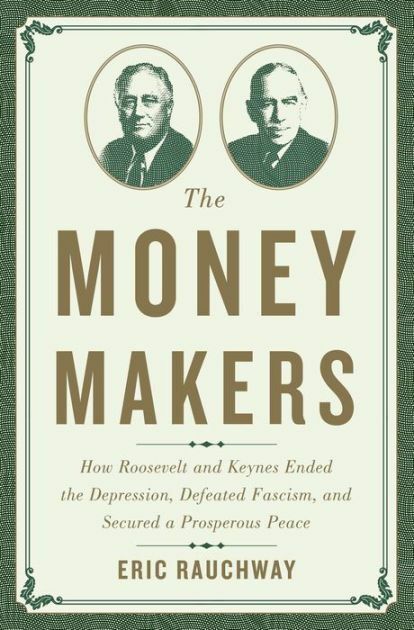 "The Money Makers" (2015) tells the story of how President Franklin D. Roosevelt was able to restore America’s economy in the aftermath of the Great Depression, with FDR drawing inspiration from British economist John Maynard Keynes for many of the programs and regulations included in the New Deal. Keynes strongly opposed the policies settled upon during the Treaty of Versailles, at the end of the First World War. He felt that the massive reparations placed on Germany would be disastrous, inducing an economic collapse that would exhibit a ripple effect in other countries' economies. Essentially, Keynes predicted the Great Depression. While Keynes’s objections to the reparations provisions are well known, Rauchway discusses Keynes’s concerns with the treaty’s failure to address questions of international money and credit. James Sommer: How did FDR initially become aware of Keynes’ economic policies, which he drew inspiration from when creating the New Deal? Eric Rauchway: First of all, I don’t think we have any direct evidence before about 1934 that Roosevelt was communicating with Keynes. However [Roosevelt] had advisors, one of which was Felix Frankfurter, who brought Keynes’ ideas to Roosevelt’s attention when he was supposed to take the presidency in 1933. Another of which was Rexford Tugwell, who was an academic economist at Columbia University. These were some of the advisors that brought Keynes’ notions to Roosevelt’s attention. JS: Some people argue that the New Deal did not actually pull the U.S. out of the Great Depression, but it was really World War II that did. What is your opinion? ER: Well, if you phrase it like that, then it is actually correct because the Great Depression did not end until 1942, or rather employment did not rise out of pre-Depression levels until then. But it is a truth that obscures other important truths. Most importantly, the logic of that statement does not make any sense. First of all, the economy was recovering, and rapidly, during the New Deal and before war mobilization, so that without the war, there would have been a recovery from the New Deal. If you say that the war created recovery from the Depression, then you are saying that because the federal government spent a tremendous amount of money it didn’t have and thus employed a lot of people that otherwise would not be unemployed. Thus you’re saying that higher employment can resolve the Depression. Instead of employing those people to build ships, airplanes, and ammunitions, just employ them to build bridges and airports. So if that is the logic, then all you are saying is that you need a bigger New Deal, not that the New Deal has some fundamental flaw. 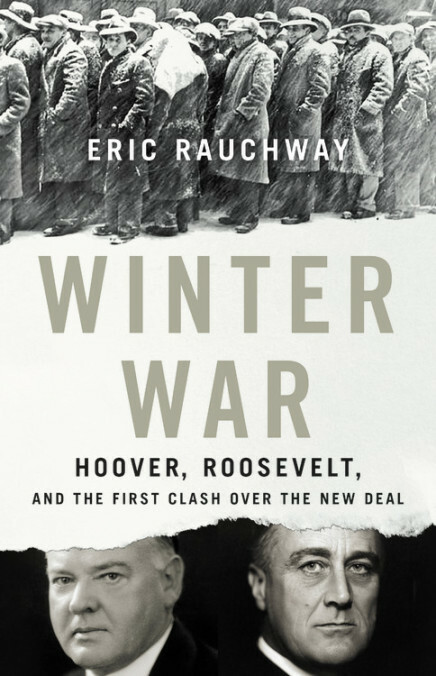 "Winter War: Hoover, Roosevelt, and the First Clash Over the New Deal" (forthcoming November 2018) focuses on the 100 days leading up to the election of 1932, the year in which FDR successfully challenged President Herbert Hoover for the presidency. Both candidates had their own ideas for restoring America’s economy after the financial turmoil of the Great Depression. JS: Because FDR won the election, I am familiar with his policies for restoring America’s economy. Can you tell me a little about what Hoover’s planned policies were? ER: There was what [Hoover] said and what he probably would have done. What he said was, and I'm paraphrasing here, ‘The only way for the United States to recover from the Great Depression was to maintain the Gold Standard’ — the commitment to redeem dollars in the fixed sum of gold. The argument was that this would inspire a confidence of investors into the U.S. economy. Similarly, he said that the U.S. should maintain a balanced budget for the sake that the U.S. would watch over responsibility to attract investments. [Hoover] spent most of the campaign explaining why everything that Roosevelt aimed to do was bad, irresponsible, and Bolshevik. He was opposed to building dams, bridges and airports due to his opinion that it was unaffordable and would destroy both the U.S. economy and the U.S. Constitution. He spent a lot more time in his speeches explaining why Roosevelt’s New Deal was a terrible idea than he did explaining what he was going to do instead. Mostly what [Hoover] advised was a balanced budget and a sound currency. To determine whether or not [Hoover] actually would have done these things is hard to say. Since the 1930 House of Representatives election, he had been obliged to deal with a majority Democratic Congress. He had signed off on some expansion of federal power to contribute to the economy — however, not enough as we can say in retrospect. If he had continued in office, it is hard to say if he would have allowed further expansion. JS: Do you think this election brought about the modern-day definitions of liberalism and conservatism? ER: It did not bring about the terms — those terms had been used. But I think that it did give the terms their modern-day definitions. It is really only with this election that Hoover tries to make the Republican Party into a party that exists to oppose the New Deal. Especially considering when Hoover was younger, the Republican Party quite often stood for expansions of power. Theodore Roosevelt is a perfect example of that and he certainly wasn’t the only one. It is sometime between about 1912, when Theodore Roosevelt ran for president for the last time, and 1932 when these terms began to change into their modern-day definitions. Rauchway, in collaboration with his wife and UC Davis history colleague Kathryn Olmsted, is currently in the process of conducting research for a new book on the recovery of the California wine industry from Prohibition. JS: Can you tell me about your new book in development? ER: This is something that I am just starting. Most of the time when people write about the end of Prohibition, they sort of say, ‘There was repeal in 1933 and that was the end of Prohibition.’ But one of the things we are seeing is that when various states legalize marijuana, it is not a single vote or law that makes the end of the ban possible. There is a lot of regulation, cooperation, or in the case of marijuana — conflict between state and federal government. There is also on the basic level, questions about tastemaking and marketing. There are also questions over choice, regulation, how do you make it safe, and how do you tax it? The same is true of the end of Prohibition. It takes a long time and requires a lot of back and forth between federal and state governments. The state of California is particularly successful in establishing a wine industry at the end of Prohibition. Some part of it is blessed by climate and geography, but some other part of it has to do with population, regulation, and that’s where we want to look. It’s a relatively short period, from about 1933 through the middle 1970s, leading up to when the California wine industry is regarded as the world’s best. We want to understand how [the U.S.] transitions an illegal industry into an incredibly successful one in just 45 years or so. JS: When you’re not teaching or writing books, what do you like to do? ER: My wife and I have a lot of kids to look after, ranging from ages 14 to 25. They all have different needs so we spend a lot of time on them. Beyond that, I enjoy cooking. That’s maybe all I really do. JS: Do your kids share your love of history? ER: As I am sure you can imagine, a lot of children of historians want to do anything but be historians. They have involuntarily been subjected to a lot of history. Whether they will recover from their childhoods on their own terms, I don’t know. We will see.